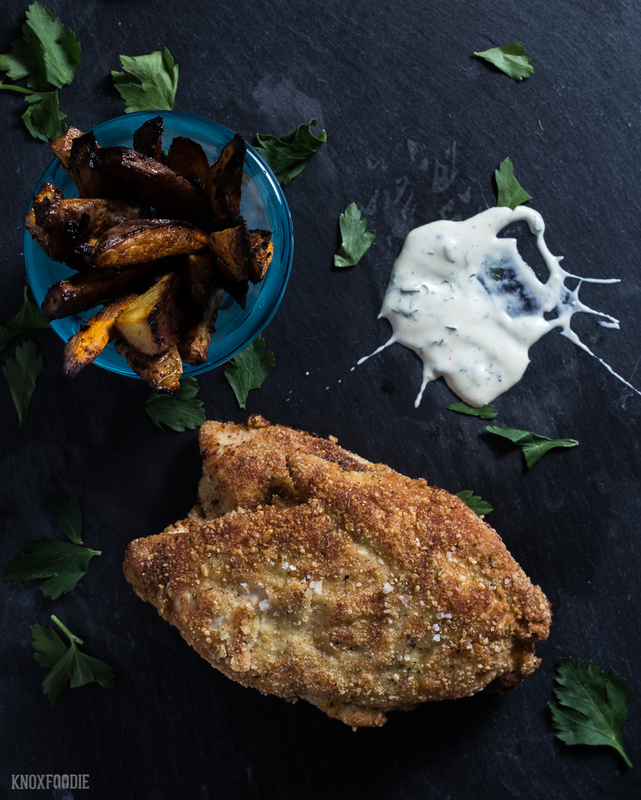 Easy Pan Fried Chicken Breasts with Garlic Lime Oven Fries and Creamy Ranch Dressing that is Whole30 and Paleo Compliant! We’re on Whole30 Day 16 and feeling normal again! They aren’t kidding when they say the first couple weeks on Whole30 are rough. They are! About Day 13 we got our energy level back, our foggy brain cleared, and the frequent headaches we’d been having went away. 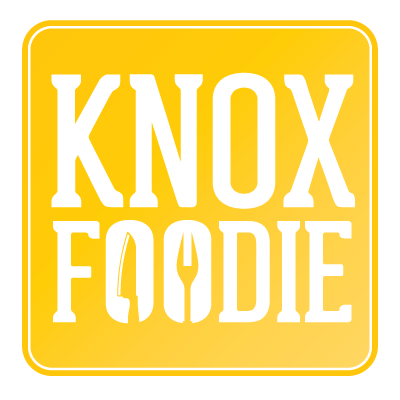 We’ve found our groove on recipe planning; we site down for a half hour or so on Sunday and map out the week of lunch and dinner. After that, we go shopping and knock it all out in an hour and a half or so. Since the weather was chilly for a couple weeks, we’d relied on a lot of soups but not this week. We’re somewhat over the whole soup thing for a while. You can’t bake on Whole30, but you can use almond and coconut flour to fry with. 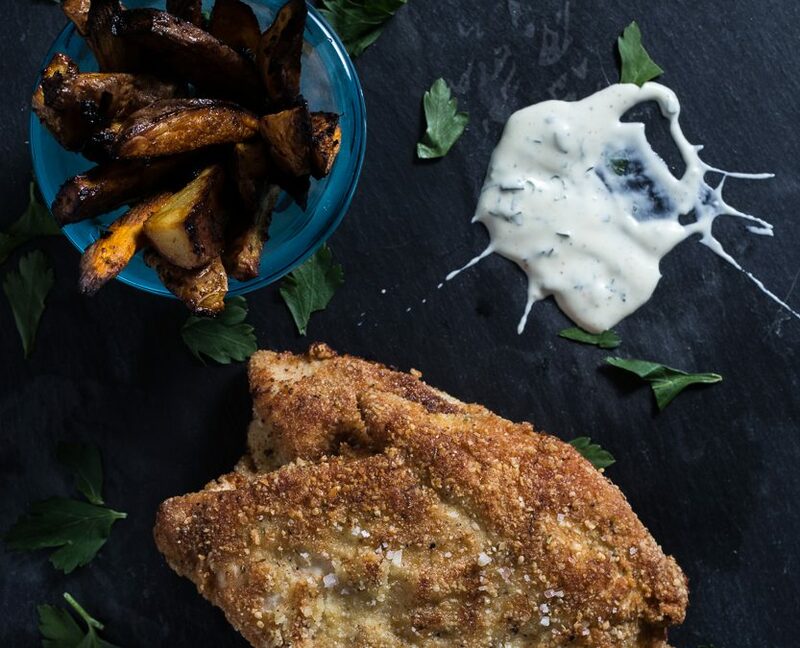 So we wanted to satiate our breaded food cravings a little with this recipe. It’s quick. It’ll come together in an hour start to finish. And you’ll want to make this chicken even when you are not on Whole30. That’s kind of the point with this entire Whole30 program. Getting in the habit of cooking for yourself and using ingredient choices that are better for you. 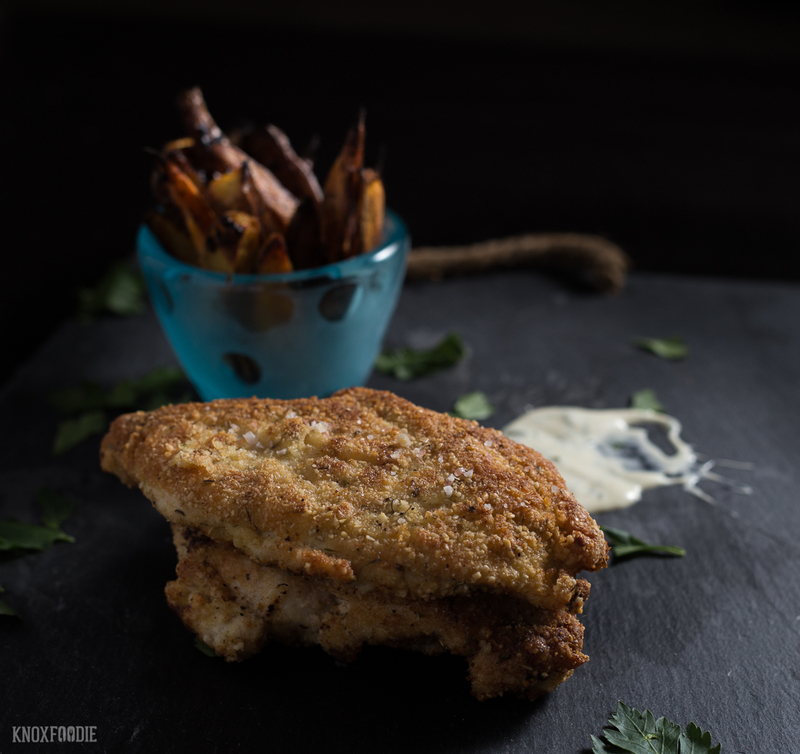 Sure, this isn’t like the Colonel makes, but it’s a delicious pan-fried chicken similar to what we would have made before with processed wheat flour. 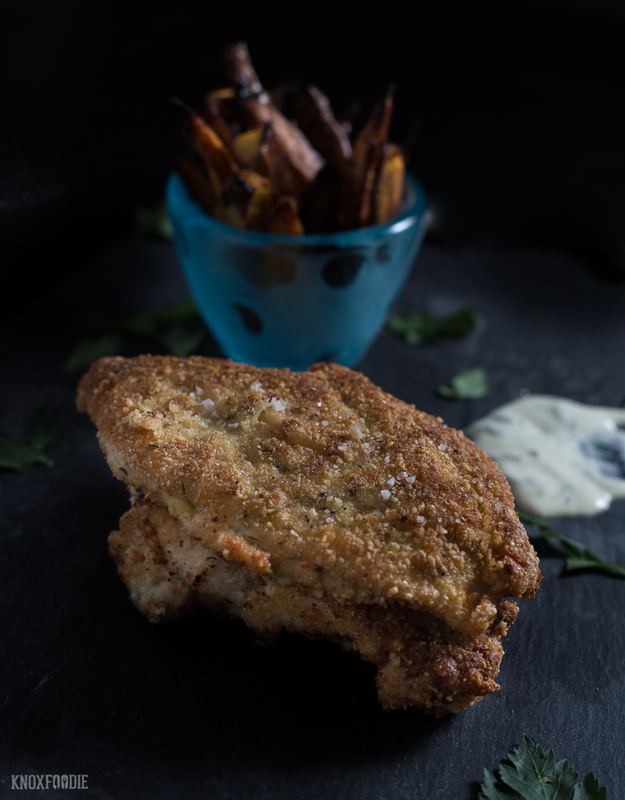 It’s actually better because the breading has more texture and again, don’t worry, it’s not going to taste like a pina colada chicken breast! Heat Oven to 350°. Cut 2 large sweet or regular potatoes into wedges. Toss with a little minced garlic, lime zest, olive oil, and salt. Bake for about 20 minutes. Flip all the fries and finish for another 30-40 minutes… or until crisp. For the dipping sauce, we had some leftover Dump Ranch that we added some lime zest and a little juice to. The combination of almond and coconut flour in these pan fried chicken breasts give them a terrific texture and are excellent leftover to top a salad the following day for those struggling with Whole30 lunch ideas. Using two sheets of saran wrap, pound chicken breasts to an even, ½" thickness. Set aside. Combine flours, salt, pepper, Italian seasoning, onion and garlic powders, and red peppers (if using) in shallow bowl (we use a pie pan). Whisk eggs in another shallow pan. Dip one chicken breast in egg. Remove from egg and allow excess to drip off.Then dredge in flour mixture pressing to coat evenly. Set aside for 5-10 minutes to allow flour to adhere to chicken. Repeat with remaining breasts. Heat have frying pan over medium heat with 3 tablespoons neutral oil and ghee. Once heated, gently lay each chicken breast into hot pan. You may have to do this in a few batches. Cook until chicken reach a golden brown color, peeking by using tongs. Gently flip chicken breasts and brown on other side. When fully cooked, remove to clean paper towel to absorb extra oil and season with salt.